Reader alert – for those of you expecting a regular movie review, please note that this is an At the Movies of a slightly different sort. Creative collaborations have been springing up all over in both fashion and decor. 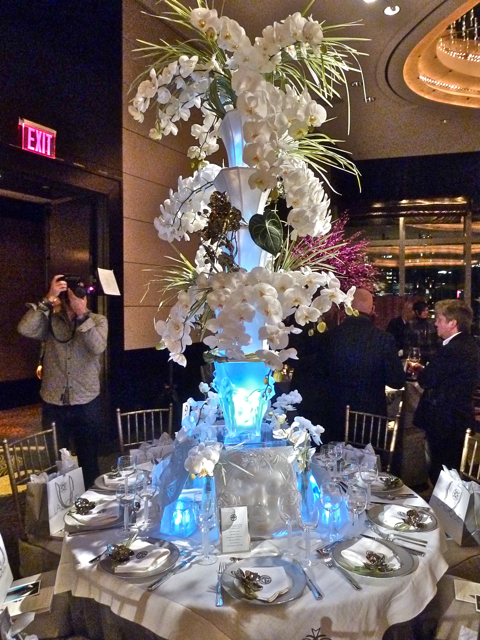 I reported last month about the spectacular table Philip Gorrivan designed in conjunction with Lalique for the New York Botanical Garden Orchid Dinner. 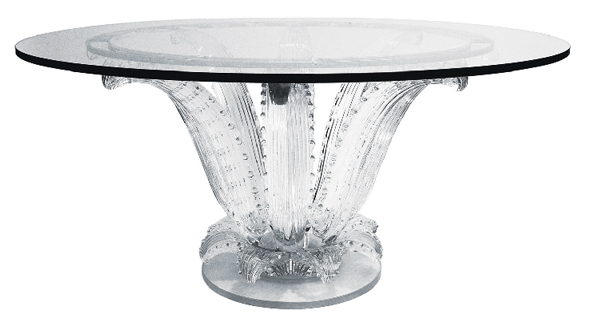 Inspired by Lalique’s famous crystal on the Normandie, his table harkened back to the ocean liner’s famous deco designs. I was interested in discovering more of what was going on with this iconic company and was thrilled to learn that they have many exciting plans in the works to update the brand, building on their distinguished heritage. 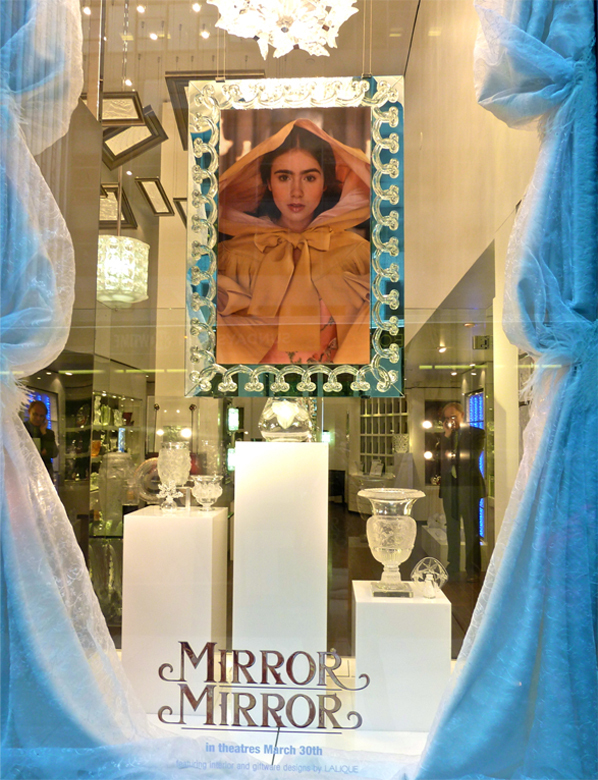 Their current venture is a fun partnership with Relativity Media who is releasing Tarsem Singh’s Mirror Mirror this weekend. 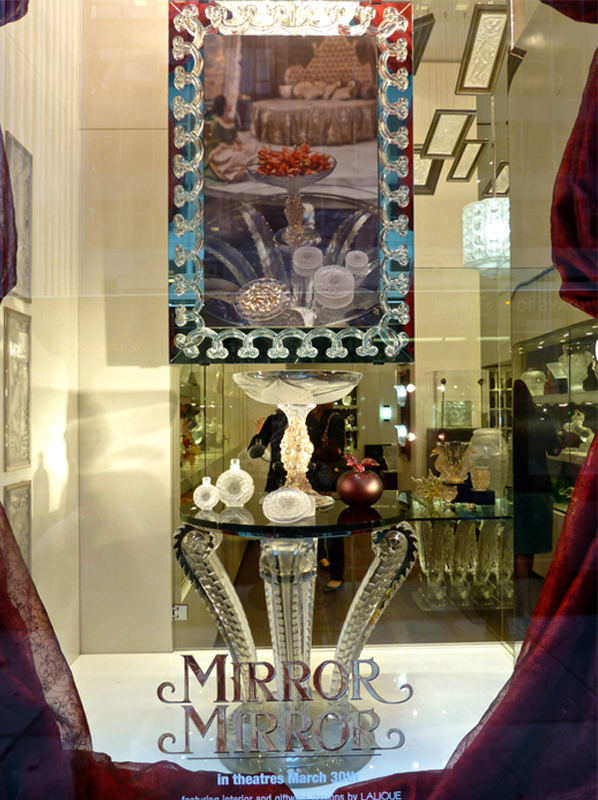 Lalique pieces grace the chamber of the Evil Queen, played by Julia Roberts and starting at the beginning of the month, Lalique boutiques unveiled specially-designed Mirror Mirror window displays celebrating the partnership in the weeks leading up to the film’s release today. In walking by the NYC flagship store on Madison Avenue, I caught a couple shots of how the windows illuminate the items featured in the movie. The anchor of the Queen’s room is the spectacular Cactus table, clearly exemplifying the amazing artisanal glassmaking skills the company is famous for. 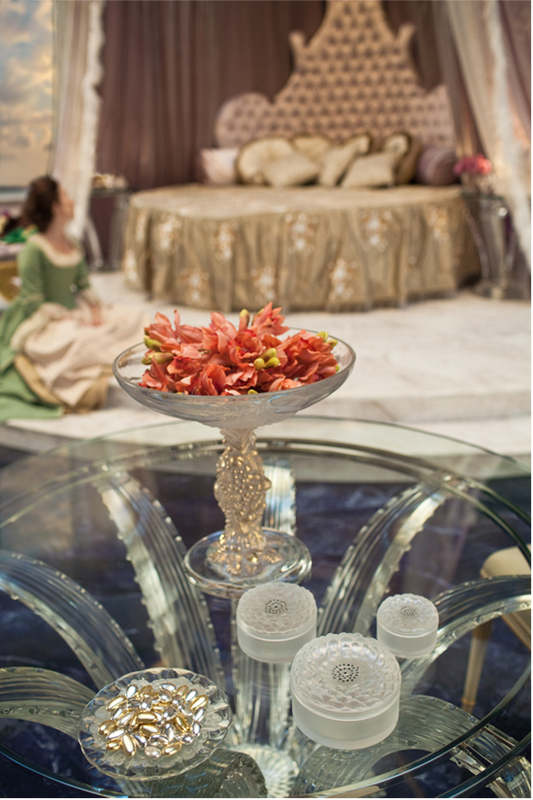 Also featured, as you can see in this shot from the set, below, are the 24-karat gold hand-painted Abundance Bowl, flanked by three crystal Dahlia boxes – so classically elegant! 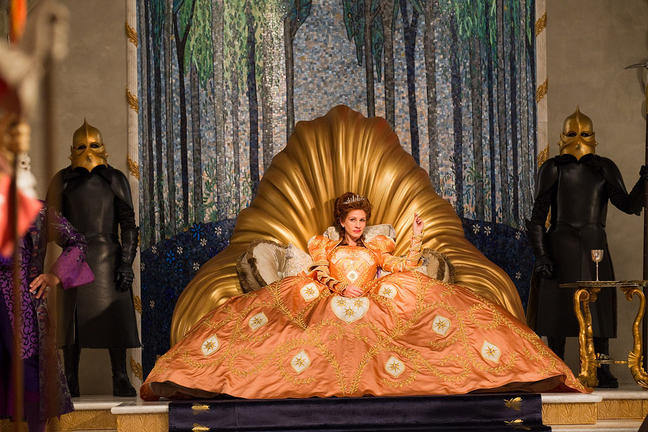 Known for his sumptuous visuals and in this case, collaboration with the late legendary costume designer Eiko Ishioka, Singh has purportedly created a feast for the eyes. 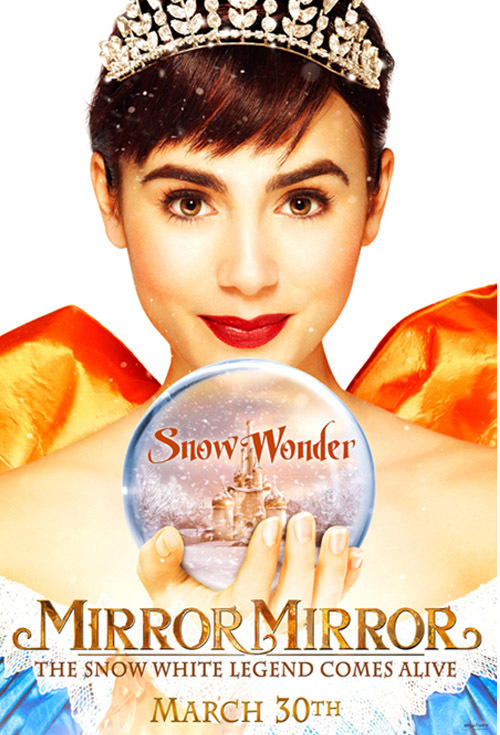 I for one am pleased to know that when I take my daughter to see Mirror Mirror, at the very least, there will be something scintillating to look at!! You can get an idea of the sumptuous sets and costumes in the trailer. On other fronts, Lalique recently hired a new creative director – Olivia Putnam (daughter of Andree) who will be unveiling her debut lighting collection for Lalique, “Orgue” next month. 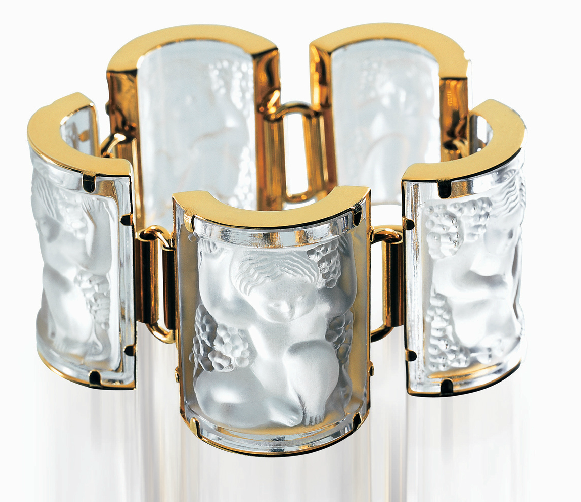 René Lalique was or course renowned for his jewelry designs. In researching this piece, I was blown away by some of the pieces in the collection such as this amazing Enfants bracelet. In May, the house will be introducing here its first fine jewelry collection in over a century. “Scared Fire Odyssey” will go back to Lalique’s roots, referencing its illustrious history of art nouveau and deco designs. And in the fall a new interior design collaboration with Lady Tina Green for Lalique Maison will feature high end furniture and accessories made in Italy that incorporate Lalique in their designs. Clearly lots of exciting things in the works for this fabled firm!! This entry posted in design, film, furniture. Entry Tags: Crystal, Lalique, Luxury, Mirror Mirror, Olivia Putnam, Philip Gorrivan Bookmark the permalink. Wow, that cactus table is really something else and so beautiful. I really want to see this movie mainly because it looks like fun and Julia Roberts is always so good but now I have another reason…Lalique! Fabled for sure! 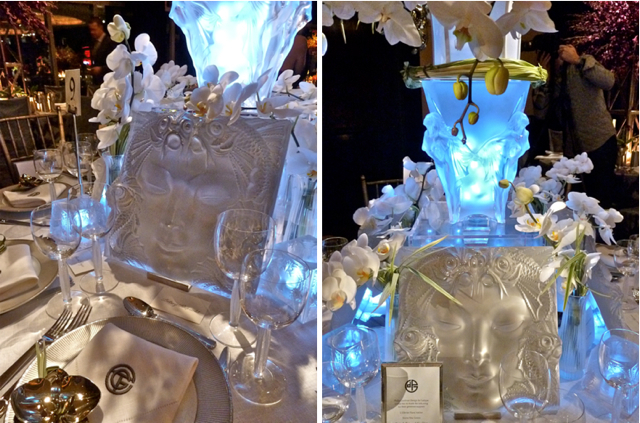 How delightful to see how Lalique continues to glow in so many beautiful ways. My aunt has collected Lalique for many many many years….I’m the only granddaughter, and have my fingers crossed! A personal fairy tale which I hope to enjoy someday would be to travel in style on the ‘Lalique Pullman’ which was built in 1929 as a first class Pullman and was decorated by René Lalique in the ‘Côte d’Azur’ style. Ahhh take me away. Mirror Mirror just might be my ticket for now! Hope your weekend finds you exactly where you want to be. Lalique crystal has been my favorite for years. Can you image owning this table? Wow. I may have to borrow a daughter to go see this one. Thank you for sharing and have a great weekend. Goodness, all of those Laliques are incredible. I had no idea about the collaboration on the movie and am looking forward to seeing it. Thanks for the information and inspiration! Lovely to know that this fabled firm plays a starring role in this new take on an old tale. I may not have know if you wouldn’t have called it to our attention! And how wonderful that they are reintroducing jewelry – that bracelet is divine! I adore Lalique. We had a client in Chicago (18 years ago) that had the Lalique table in her Entry. It was lit from below and was spectacular. I die for that bracelet. I remember the first Disney version and being terrified! I would sport that bracelet in a NY minute! I love the collaborations – so interesting. Will make seeing the movie that much more fun! Beautiful post! What a fabulous and fresh collaboration! I think this movie looks so fantastic and now I’ll be viewing it with an eye to catch all the Lalique!! How amazing it would be to have seen the sets in person! This post strikes home with us as we recently had to find the perfect vase to pair with the Lalique Cactus Table for a client in New Jersey – needless to say, the table doesn’t need much to shine. Happy weekend, Q! How fun to see these amazing pieces that were created just for this movie. I would love to see this movie. We volunteer at the museum near us and when the “Narnia” tour came through, it was so fascinating to see the ‘behind the scenes’ items up close.